I hope all my mom readers had an excellent Mother's Day! My kids treated me well, not fighting too much, and giving me some wonderful homemade gifts and coupons. I planted flowers, prepped my garden for vegetables, enjoyed a home spa day with mani/pedi and scrub (all done by my daughter) and then home-made dinner by her as well (salad and grilled cheese sandwich). I wanted to share some news that made my Mother's Day even more special. Frisco Kids was recognized by Red Tricycle as one of their "best favorite family travel blogs we love." Given that Red Tricycle is an awesome website, I was thrilled to be included - especially with the other fabulous blogs they chose. Check them out! 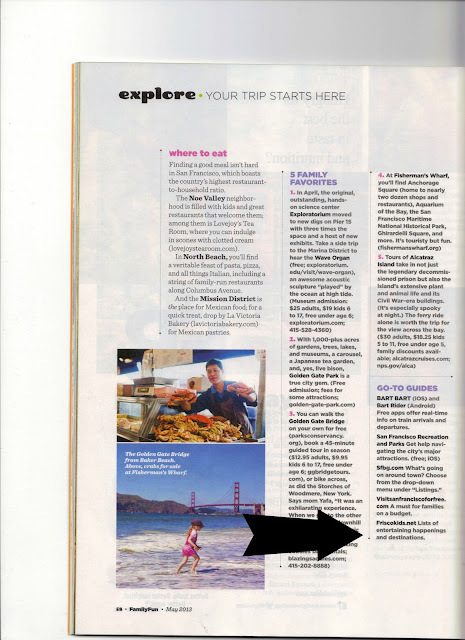 Also amazing, is that FamilyFun Magazine included Frisco Kids in their "go to guide" in their May, 2013 article on traveling to San Francisco. It's on page 58 for those of you get the magazine.